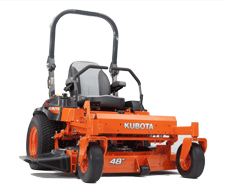 Completely designed and manufactured in the USA, the heavy-duty, commercial-grade Kubota Z700 Series is built to enhance your reputation for quality work. With impressive features, the Z700-Series lineup reaffirms Kubota's reputation for distinct excellence in engineering and reliability at a competitive price. COMMERCIAL GRADE ENGINES: The Z700 Series mowers are powered by KAWASAKI® FX and KOHLER® Command PRO engines, renowned for their superior performance and lasting durability. DURABILITY: 1. Sealed, greaseless spindle bearings. 2. Thicker and more durable main frame (2 x 3 in. tubular steel frame). 3. Flat-free front tires to better absorb impacts on the job and reduce the worry of downtime. EXCEPTIONAL CUT: Each model features a 6 in. deep, fully welded, 8 gauge steel mowing deck, providing outstanding stability with a fast, high quality cut. EASY MAINTENANCE: 1. 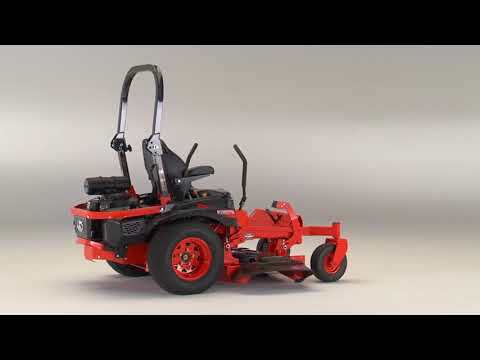 Easy mower belt replacement - belt drive is conveniently located for easy access. 2. Open engine compartment allows access to vital components around the engine without obstructions. 3. Battery and harness parts can be accessed just by raising the seat panel. 4. Equipped with dual Parker® transmissions; designed for easy maintenance, each transmission has an integrated pump and motor for increased efficiency and simplified service. 5. The mower deck can be easily attached and detached just by inserting or removing the two pins on either side of the Z700. EASY OPERATION: 1. Ergonomic instrument panel. 2. Foot operated hands-free parking brake. 3. Quick dial height adjustment system lets you adjust the cutting height with a turn of a dial and press of the pedal. OPERATOR COMFORT: 1. Thick cushioned, 19.6 in. high seatback with adjustable armrests and slide adjustment. 2. Smooth lever operation for effortless control and drivability with adjustable damper force. 3. Adjustable levers and mower deck lift pedal can be raised or lowered to better match the physique of the operator. 4. Wide operator platform with ample legroom so you can work more comfortably. 5. Handy storage box and cup holder. 6. Foldable ROPS to ensure operator safety.